I had been thinking about posting my china tea set since I started blogging earlier this year. And, then my mother gave me a string of beautiful pearls on my last visit to see her. At that moment, I knew the post was complete. Pearls, Silver and Heirloom china. What more could a women want. I had some of my heirloom silver on Show and Tell a past post Click Here. My father gave the strand of pearls to my mother as a gift just after my sister was born in (194?.) The tea cups, saucer and dessert plates are from a place setting for six. I inherited the dishes from my paternal great-grandmother about 15 years ago. The elegant look of Pearls and Silver and a Tablescape with Pink roses makes a wonderful setting for an Inspiring afternoon tea. A beautiful gold clasp with a diamond in the center is so delicate. The pearl is a symbol of purity and often given to celebrate a marriage or a birth of a child. My father was a wise man. And, my mother gave the pearls to me with all her love. I would say these pearls are Vintage. Just like me!!! And, my birthstone happens to be a Pearl. R. S. Prussia - Reinhold Schlegelmilch a private owner of a porcelain factory is Suhl, Germany. And, I thought homemade scones and homemade pomegranate jelly would be nice on the dessert plate. This spoon measures 4 1/2 inches long. 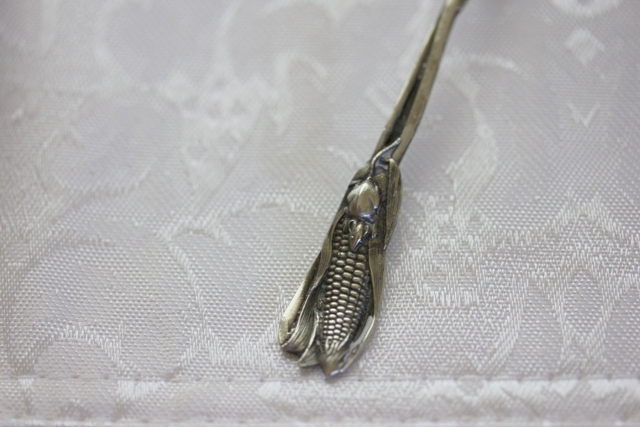 I 'm only guessing the Sterling Silver ladle spoon was used to serve jelly from a small dish. The precious dishes are so charming and I have enjoyed sharing them with you. 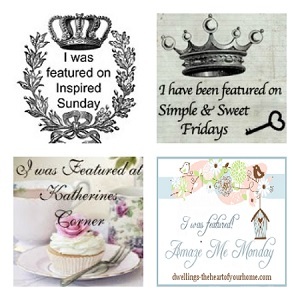 I'm joining some of my favorite blogs to share my Pearls and Silver. I am sitting here with my morning coffee, reading your lovely post. What an exquisite pearl necklace and how lovely that it is now yours! 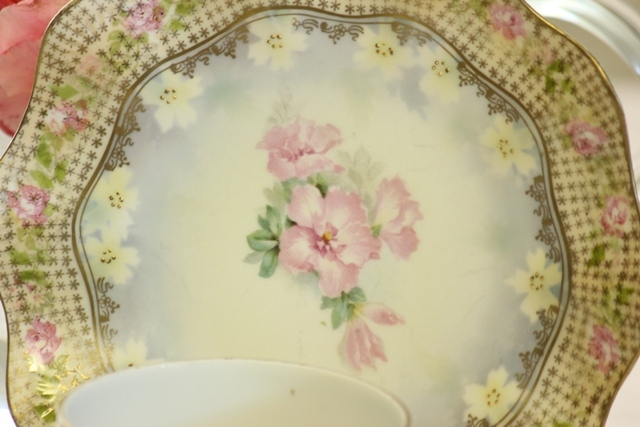 The china is gorgeous with its florals and lovely detail. The spoons are darling! My mother just gifted me with her silver which had been a wedding gift from her mother. Thank you for sharing. It's been a real pleasure and have a beautiful day. You display your family treasures beautifully! Your setting looks very inviting. 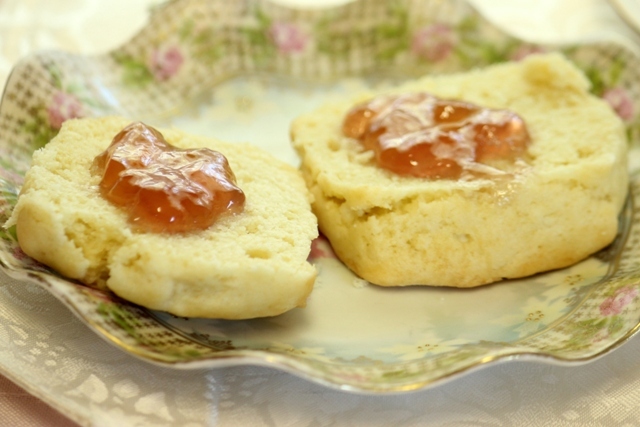 I love scones, but have never had pomegranate jelly. I love all your vintage things today. You used them very well in your table setting. I think the detail on the soopn is great. Beautiful, and great pictures too! Everything is so lovely! 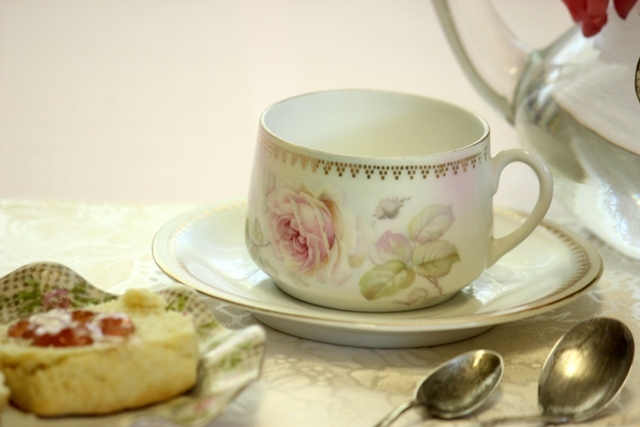 I have a weakness for a tea cups with pink flowers and I adore your spoon with the etching - I've never seen anything like that before. Oh, I enjoyed your post! What a lovely story, and what beautiful china! I love the shape of that dessert plate, especially. Simply Beautiful!! 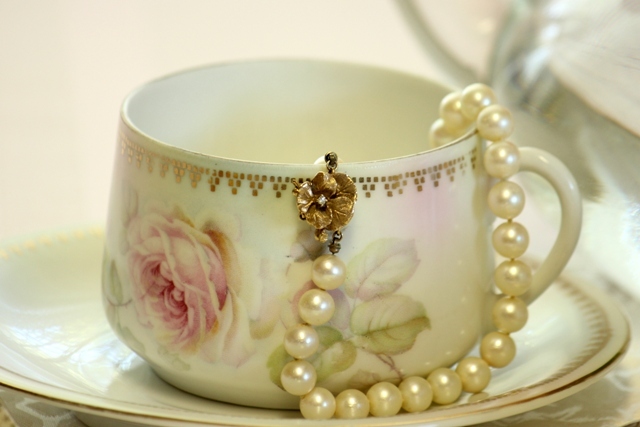 I love the pearls with the Georges china.....that pattern is so elegant looking. Happy VTT! Beautiful! I love tea-sets and silver...and for that matter pearls too! 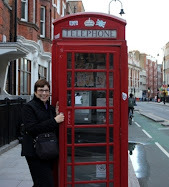 Thank you for paying a visit to my blog earlier today! Betty, thank you so much for linking this up to the party this week! I have such a thing for pearls and have one special ring that my dad gave to my mom when I was born. I can't wait to pass it on to one of my kiddos someday! Thanks for reminding me why I love them so much! beautiful and precious beauty as this worth shared the beauty in beautiful pictures! Love them all! Such lovely things! I'm sure they are even more special to you with the meaning behind each piece. Those things are all absolutely adorable and so dainty. I particularly love the beautiful china. Betty, what beautiful items! I LOVE the whole table set! 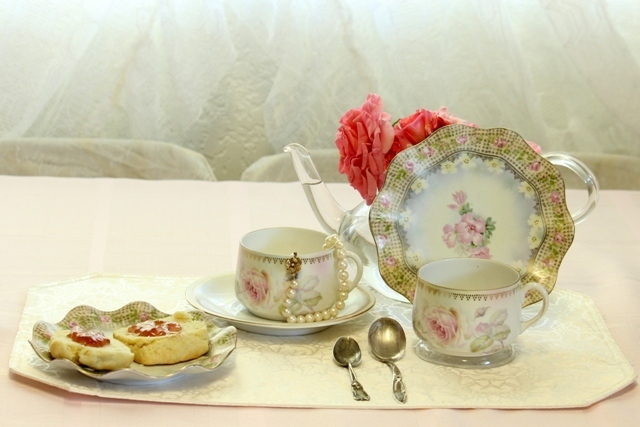 From the gorgeous pearls to the hand painted china to the little demitasse spoon so detailed and pretty, just gorgeous! I'd be so pleased if you'd join me for Pearls and Lace Thursday!! I'm also having a giveaway if you'd like to join me! Lovely post. I have china from my paternal great-grandmother that I have yet to share here. Your's is lovely and your photos are great. Happy VTT! Beautiful post and I agree what more could a woman want! I love dainty china!! Your china is so delicate and dainty!! Very pretty shot...such beautiful china ! 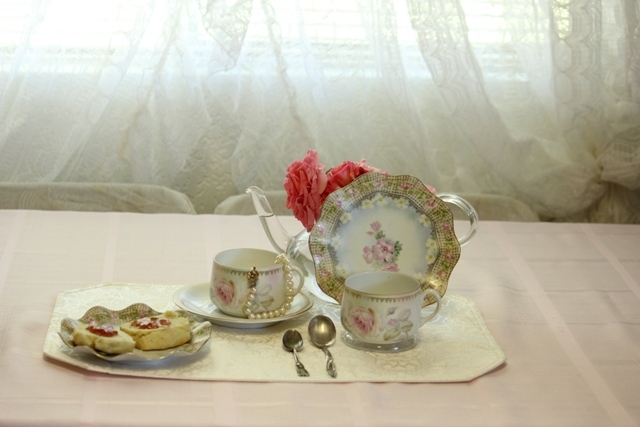 Just love the delicate china and the pearls! I have pearls that were my mothers - she is gone now and I always think of her when I wear them. I am visiting via Pink Saturday - I think this is my first visit! What a lovely post! Pearls are beautiful..even the word pearl is beautiful. The silver and the china...it's all stunning together! I am back to wish you a beautiful Pink Saturday weekend. Such a lovely post! Ohhhh my...what a gorgeous tea you have set, my friend! It is filled with all of my favorite things...pretty dishes, exquisite pearls, and beautiful silver! 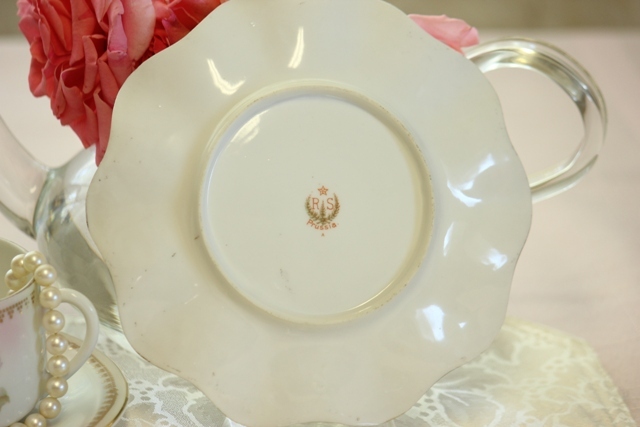 The RS Prussia plate and teacup is sooo beautiful. The pattern really is delicate and so intricate. 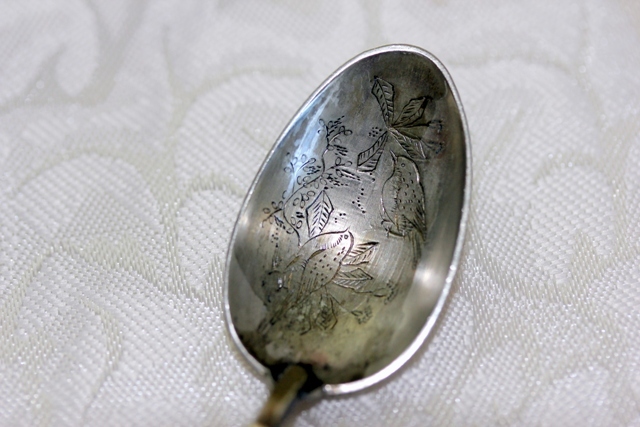 I love your little silver spoon with the bird engraving! I'm wondering if there is an entire set of silver done in this pretty pattern? Betty, all of these things are such sweet treasures, family heirlooms!!! Thank you for sharing them with us today! This is the most beautiful and sentimental post. I LOVE it all!!! 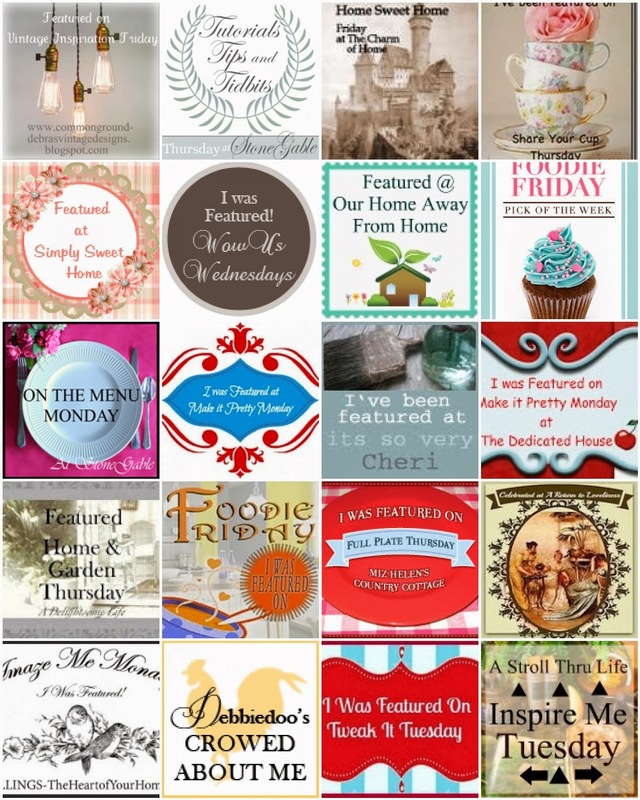 Your story is "Priceless" just as all the heirloom details... I'm in LOVE with those pearls and the ruffling on those plates is SO Unique. I'm definitely going to be on a hunt for a few...Thank you for sharing this with us. Oh my, that is simply stunning! Your RS is breathtaking and the pearls look so beautiful with it. Just gorgeous! love it all, and the scone looks yummy. That was a beautiful post - pearls and silver and china....some of my favorite things. My parents gave me pearls for my 21st and I'll pass them on to my daughter one day.